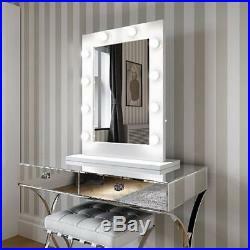 Hollywood Mirror Illuminated Stylish Vanity Makeup Mirrors For Dressing Tables. Mon - Fri : 8:30am - 9:00pm. Looks a very good product. The Original & Best Hollywood Mirrors. Sparkle like a Hollywood starlet with our fabulous dressing table mirror with lights around it. Your beauty area will be instantly transformed with the glittering radiance of our popular illuminated make up mirror. Beauty junkies across the globe are in love with the allure of this stunning makeup accessory. Featuring cool white led light bulbs for a jaw-dropping look every time you get dressed, youll wonder how you ever lived without this genius tool. Julia White Gloss - Mirror Dimensions: Height 80 cm x Width 60cm. Base Dimensions: Height 2.5cm x Width 70cm x Depth 26cm. Mirror Dimensions: Height 80 cm x Width 110cm Base Dimensions: Height 2.5cm x Width 108cm x Depth 26cm. Angelina Black Gloss - Mirror Dimensions: Height 80 cm x Width 60cm Base Dimensions: Height 2.5cm x Width 68cm x Depth 26cm. Marilyn Black Gloss - Mirror Dimensions: Height 80 cm x Width 110cm Base Dimensions: Height 2.5cm x Width 108cm x Depth 26cm. Halle Round - Mirror Dimensions: Height 70 cm x Depth 6cm Base Dimensions: Height 2.5cm x Width 69.5cm x Depth 27cm. Diaz All Mirrored - Mirror Dimensions Height 80 cm x Width 60cm Base Dimensions: Height 2.5cm x Width 69cm x Depth 27cm. Nicole Wall Mounted - Size: Height 60 cm x Width 100cm. Penelope Wall Mounted - Size: Height 60 cm x Width 80cm. Meryl Wall Mounted - Size: Height 60 cm x Width 60cm. Alicia - Mirror Dimensions Height 60cm x Width 60cm x Depth 6cm Base Dimensions: Length 70cm x Depth 26cm. Rihanna - Mirror Dimensions Height 60cm x Width 60cm x Depth 6cm Base Dimensions: Length 70cm x Depth 26cm. Can be Wall Mounted AND Table Top. Nicole 60 x 100cm Xl Wall Mounted. What if my item was damaged in transit? In some cases the driver may leave the parcel with a neighbour which will be signed for and the courier will notify you of this on the calling card. For some glass and large fragile items we use a third party carrier and this ensures they get there safely. If you cancel your contract once your order has been despatched you will be responsible for returning the goods to Design55 at your own cost. Established in 2005, Decorelo is a leading independent designer home accessories, home interiors and gifts store. Our unique online store features the current and latesttrends from the interior design world as well as popular iconic products and design classics. Join our Mailing List for the Latest News & Exclusive Offers. Listing and template services provided by inkFrog. 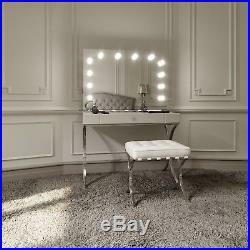 The item "Hollywood Mirror Illuminated Stylish Vanity Makeup Mirrors For Dressing Tables" is in sale since Friday, July 27, 2018. This item is in the category "Health & Beauty\Make-Up\Make-Up Tools & Accessories\Make-Up Mirrors". The seller is "decorelo" and is located in Elland, West Yorkshire. This item can be shipped to United Kingdom, United States, Japan, Canada, Ireland, Australia, Germany, France, Greece, Italy, Spain, Austria, Belgium, Bulgaria, Croatia, Cyprus, Czech republic, Denmark, Estonia, Finland, Hungary, Latvia, Lithuania, Luxembourg, Malta, Netherlands, Poland, Portugal, Romania, Slovakia, Slovenia, Sweden, Brazil, New Zealand, China, Israel, Hong Kong, Indonesia, Malaysia, Mexico, Singapore, South Korea, Switzerland, Taiwan, Chile.